Sleek black look makes this a stylish tech bag! Faux-leather bag features an angled zip pocket and removable shoulder strap. Color inserts mimic the uniform colors in the original Star Trek TV series! Measures 12-inches long x 7 1/2-inches tall x 4-inches wide. Got lots of Starfleet Academy homework to tote around? This Star Trek Original Series Retro Tech Bag will serve you well! The faux-leather bag features contrast piping, an angled zip pocket with complementary color inserts mimicking the uniform colors in the original Star Trek TV series, perforated material panel with Star Trek logo screen printing, and reinforced bag-length handles. 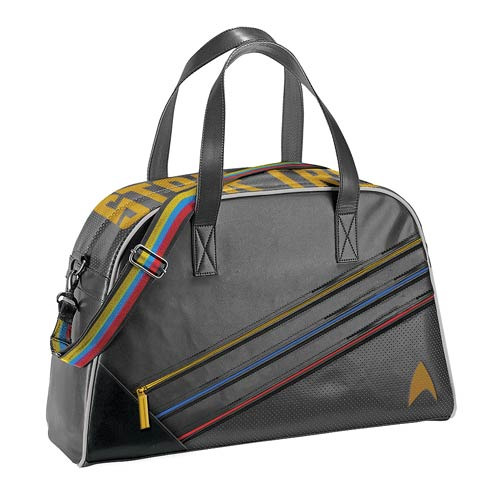 The Star Trek Original Series Retro Tech Bag measures 12-inches long x 7 1/2-inches tall x 4-inches wide and comes with a removable custom-woven nylon webbing shoulder strap. Ages 14 and up.